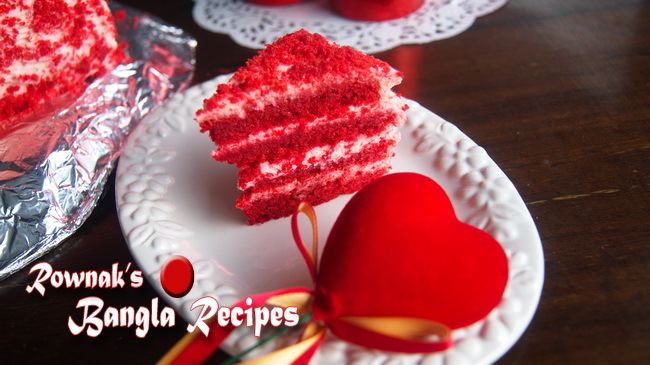 Red velvet cake is originally from USA. 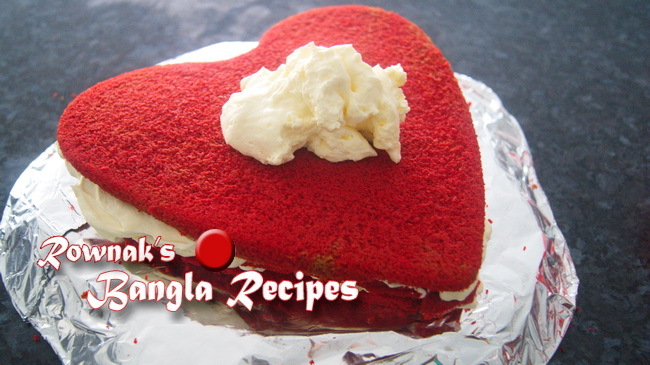 This gorgeous cake goes very well in valentine day, anniversary or birthday. 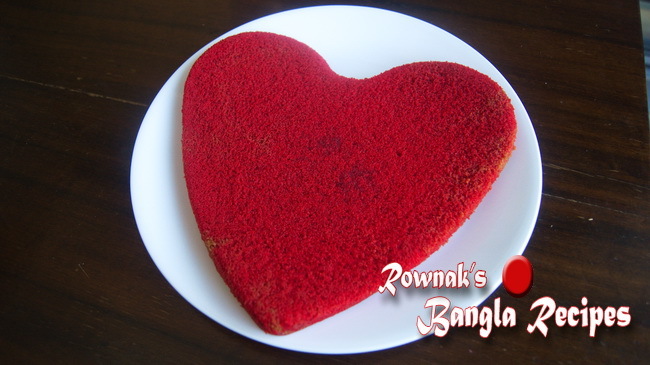 I was not very keen to upload this recipe because of not very Bangladeshi. I got lots of requests for this. That’s why I am giving it. This recipe is inspired by www.joyofbaking.com. Also need two same size cake pans. 1. For butter milk mix milk and vinegar together and keep aside for 10 minutes. 2. In a mixing bowl sift together the flour, salt, and cocoa powder and keep aside. 3. Mix butter milk and red colour together. 4. Preheat oven to 175 degrees C.
5. In bowl of your electric mixer or with a hand mixer, beat the butter and sugar beat until light and fluffy. 6. Add the eggs one at a time and beat well ; add the vanilla essence. 7. Add flour mixture and butter milk alternately( I mean add bit flour , beat it, then add bit butter milk and beat; continue this process till all flour and butter milk added to batter. 8. In a small cup combine the vinegar and baking soda. Allow the mixture to fizz and then quickly fold into the cake batter. 9. Divide the batter evenly between the two pans and bake in the preheated oven for approximately 25 – 30 minutes, or until a toothpick inserted in the centre of the cakes comes out clean. Let it cool down before we start frosting. I cut each cake in half to make four layers. 10. Beat the cream and add icing sugar little at a time. Beat till you get stiff peaks. 11. With a serrated knife, cut each cake layer in half, horizontally. You will now have four cake layers. Spread the cake layer with a layer of frosting. Place another layer of cake on top of the frosting and continue to frost and stack the cake layers. Frost the top and sides of the cake. 1. Sift the flour and then measure it. 2. Refrigerate the cake before cutting the cake and frosting to make easier. rownak api… how much sugar do we have to use in this cake?? can we use baking powder instead of baking soda?? here in BD baking soda is not available..please reply. In Bangladesh baking soda is called khabar soda(sodi bi carb), it is available in Bd. you can buy from any grocery (mudi dokan). Baking powder does not go to red velvet cake. sugar will be 1 cup. hope it will help. Thanks. Omg.. rownak api, I just love all ur recipes.. I have tried many of them.. and all came out awesome and of course very yum as I expected. And now um gonna try dis velvet cake to surprise my hubby.. hope it comes out perfectly.. Well, just let me know the temperature to bake it. Sumaiya api thanks a lot for your good words. you need bake on 175 degrees C and best of luck.